One of the big thoughts in my mind currently is to better understand how we can create, instead of react to, our future. In scripture Jesus talks about “abundant life” and many have sought to define just what he meant by those words. There is also in scripture a dialogue with Jesus where he mentions, almost in passing, that the “things I do, you will do more”. I don’t know about you, but for me, most of my life in church has been spent looking for a way to live that life and do the the things Jesus spoke of. We can expand and look at other scriptures from other major religions and find similar passages. Yet in all of this religious speak, for evidence we have a handful of people who have impacted the world. It is my belief that there is a way for each of us to live life in a “flow” of exemplary moments that work together to bring about a change for the common good. Some may say I’ve lost it or that I’m naive, but I truly think that we live life on auto-pilot most of the time, and if we would learn how to “live” we would see things that each of us internally desire but externally are impoverished as to both the “what” question and the “how”. I’ve said before that the “how” is not my domain, and I believe it more today than ever before. One thing that I have uncovered is the role comapssion has to play in living a life full of little miracles. We all know we should have compassion on others, but the most important I’ve found is compassion for ourselves – present and past. The biggest lesson for me in my own developmental path has been to learn to display compassion toward myself for past shortcomings and failures. This is one of the greatest steps to head you forward on your own path of developmental transformation. We must let go and let life “flow” through us instead of trying to unsuccessfully control our lives. Once the past is dealt with, the present and future are free to move forward unentangled. The days that sit between Christmas and New Years have always intrigued me. For months we’ve looked toward the Christmas frenzy and then, in those few days, Christmas is over and the New Year is coming. It is in these days that reflection can come – in between a few naps! Reflection is good and natural at the end of anything, but especially at the end of a year. The most typical feeling I’ve encountered from people can best be explained by St. Catherine of Siena in her dialogues. God is reported to have said to her, “I am He who is; and you are she who is not.” Have you ever felt that way? Have you ever experienced your is-not-ness? If you look back on this year and notice items missing or experiences lost; if you’ve come face-to-face with your is-not-ness, recognize it, reframe your plans and reimagine what the next year can be. Sunday was a day for big announcements. John Sloan our bass player was leaving to go to Cincinnati, service times were changing from three back to two services, and I was stepping out into a new place of uncertainty and question marks. Sounds like you should have been there, right? Change was the topic of conversation. I mentioned Robert Quinn and his book, Deep Change. We all are faced with opportunities to choose Deep Change, yet even in our inaction we make the decision to live within the status quo. The decision to embrace Deep Change is a decision that will shift your way of thinking and making meaning in the world, but it is also the only way in which we can truly grow as human beings. Personal Transformation is a topic that encompasses both the spiritual and mental capacities we posses. In order for a person to experience Spiritual Transformation and Mental Transformation, the lenses with which we see our lives have to also change and be embraced. The best lenses are the ones we aren’t aware of. When we have a shift in our “seeing”, it takes time for the new lenses to integrate themselves into our lives. The first step is to recognize that the lenses you are currently looking through aren’t letting you see things the way you are accustomed to seeing them. Just like with real eyeglasses, when things start to become hazy and blurry, it’s time for new lenses to clear up your vision. As I continue on in this journey, I hope you will also share your experiences. I also hope that my decision to embrace transformational change will spur you on to begin your own journey of transformational change. There is a saying that – “Anything can be improved”. In the world economy, these simple words provide the foundation for asking questions. Every time we look around we find things that could be better. What should be there that is not? What can start with what we know or are passionate about? What bothers us? What’s missing? We can come up with a very long list of things we wish were different or could change, or have the interest or skill to do something about. In these lists are the beginning ideas of some of the most profitable businesses around. Google found a better way to search, Amazon found a better way to buy books, Ebay found a better way to sell everything. No super magic formula, just an opportunity to make things better. These same principles apply wherever we find ourselves. The next big idea could come from you looking around and seeing something that could be done better. There are many different groups of people who meet and know each other in various ways. These groups of people can be a formal business group or just a group of people who are interested in the same kind of books or art. There are times when we, as members of some of those groups, want to make something happen or get something done. More often than not, nothing is eventually what happens. Even though we have very good intentions, the end result is that everything stays the same. Used to be, you needed to convene a committee to make a proposal to get something done, especially in business. Now things are different. The one thing that is needed to move your group toward being a movement is a leader. And there is no reason that leader shouldn’t be you. Yeah, you heard me right, you have everything it takes to be a leader. You have an idea of something that, if done, would change the way the future of your group looked. You will not be able to push people where you think the group should go. You have to lead them where you know they want to go. People want change. Change is far more inviting than “same”. Change has risk, which is why they need you to lead them. Having a leader helps people go where they want to go. As a leader you get to see your group begin to move and become a movement. Take up the challenge and take your group that is probably stuck somewhere and be the leader we all need to get things going. I just finished a new book by Seth Godin. Seth is one of my favorite authors. In just about every case, every book of his that I have purchased has been outstanding. Tribes takes the cake. This is one book you simply must at least give a glance over – I’m certain that you’ll buy it if you glance at it! You would think, at first, that the book would be about Tribes, or a “fable” about a tribe (fables are all the rage now in business writing). 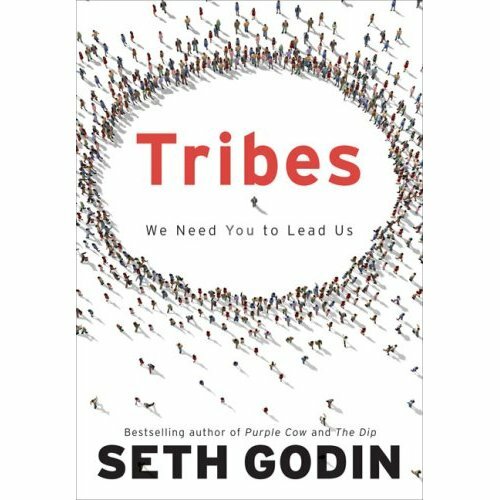 You may even think that perhaps Seth is interested in setting up his own tribe. You would be wrong. Tribes is about you. Tribes is about your inner struggle to become “you”. The book incessantly makes you look at yourself and ask “Why are you not doing what you know you want to do?” Then, before you have a chance to bring up a reason, he’s already told you why the excuse you’re about to give isn’t good enough to warrant inaction. I’ve begun reading it again and will probably read it several more times. I found myself reading a paragraph or page and then closing the book to think. Then I would read a little bit more and think some more. To say that this was a book whose timing was perfectly matched to my own individual circumstances would be an understatement. The great dividend of this book is that I would bet that I’m not the only person to have those thoughts. If you have an idea in your mind and have found reasons not to pursue it, read Tribes and then go do it!